Step 1. Prehat oven to 180C (160C fan-forced). Line two baking trays with baking paper and set aside. Sift flour and baking powder together. Step 2.Using a mixer, beat butter until pale and creamy. With the mixer running, add sugar and then eggs one at a time. Add vanilla and then flour, mixing until the flour is just combined. Divide mixture into two discs and refrigerate for 20 mins. Roll out on a floured board to around 4mm thick. 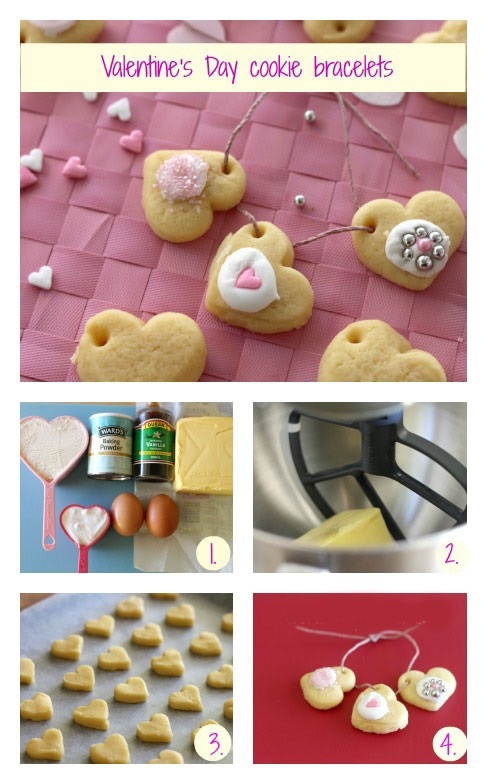 Step 3.Cut heart shapes out with the cookie cutter, taking care to dip the cutter into flour between each cut. Work as quickly as possible because this mixture needs to be firm to make clean cuts. Step 4.Using a clean skewer, use the flat end to make holes to thread the string through. Bake for 7- 10 minutes and remove from oven when still pale. Cool on a wire rack. Prepare a small quantity of Royal icing and dot a little on each cookie to adhere decorations with. Leave to dry for 2 hours or overnight until the icing has hardened. String 3-4 cookies on a string for each bracelets. You can also make these into cookie pendants if you don’t have a small enough cookie cutter.